ST Heating Services Ltd specialise as commercial gas engineers in Manchester. Based in Swinton, our contractors cover all areas in the North West, providing a professional, friendly gas service for commercial boilers in and around Swinton. We operate to the very highest standards and are registered with the Gas Safe Register, the official list for gas engineers to ensure they are qualified, as well as working safely and legally on boilers, cookers, fires and all other gas appliances. As well as the Gas Safe Register, we are also registered with other industry bodies including Constructionline and Corgi. 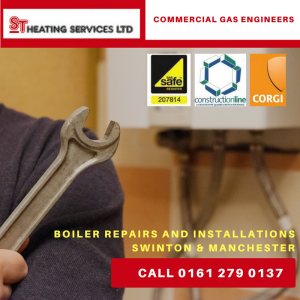 Many local businesses in Swinton and around Manchester rely on us to install and maintain their commercial gas boiler systems. We work hard to ensure the premises are kept safe and legally compliant. Whether the business is small or large, we are on hand to meet your gas heating needs and can help you choose the right type of boiler system. Our engineers work tirelessly around the clock and are on hand whenever you need us. We promise not to bombard you with technical jargon and are respectful to your property, home or place of business. Thanks to our location in Swinton, we are able to cover the Greater Manchester areas with ease. Our gas installations, repairs and maintenance quotes are competitive and easy to understand. ST Heating Services have built up a great reputation within the industry and we take pride in our work, whatever the job. Our aim is to ensure your gas boiler or heater is installed or repaired efficiently so you are not left in the cold for too long. As well as helping as commercial gas engineers, we also provide a range of commercial and industrial plumbing services. Call our expert commercial gas engineers on 0161 279 0137 or get in touch via email at info@stheatingservices.co.uk for a quality, professional service.